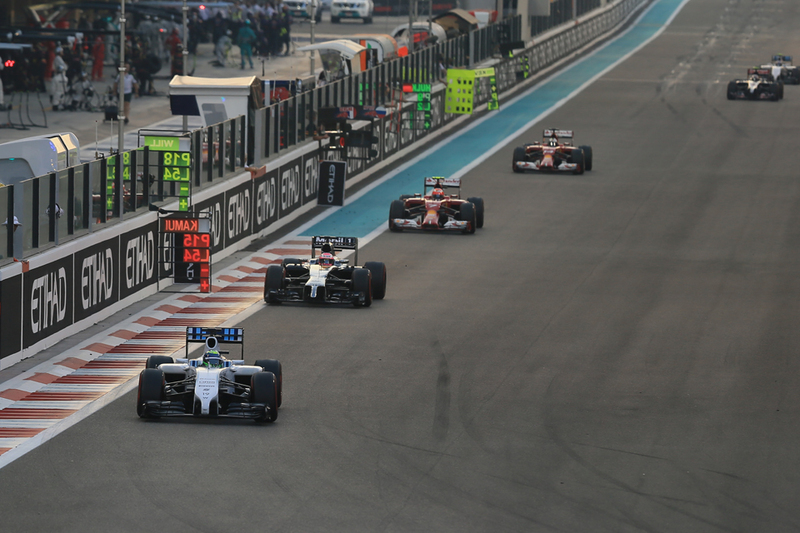 For these reasons and more the Abu Dhabi race is one that has divided opinion. But it has a few things going for it. Even now in visit number seven and after plenty of newer circuits from Tilke's pen arrived in between times it retains the status of being the standard bearer F1 venue in terms of modernity and having an everything's-been-thought-of quality. Furthermore the place never fails to be visually stunning, with it appearing presumably to the uninitiated like cars are racing around some kind of futuristic civilisation, surrounded as the track is with all gleaming, shimmering, towering architecture. It has as its centre-piece too the imposing Yas Viceroy hotel which the track passes under, and which shines in ever-varying coloured LED lights and attracts many a wide-angled camera lens. Uniquely it is a day-night race too, and the dusk lighting is reminiscent of Le Mans. Its man-made marina filled with ostentatious yachts is a little redolent of Monaco too. More broadly the race's promotion is energetic, the crowd numbers not terrible and combined they lend more of a sense of permanence than at many of those other new-fangled events mentioned. Therefore the sport's fraternity hasn't quite sniped at this event with the ferocity that it has sniped at a few others. As noted this particular Grand Prix is a bit of a victim of circumstance too. Unlike the 2010 and 2014 equivalents there will be no last gasp drivers' title showdown to keep us occupied. F1 rather has been in dead rubber mode for a while - Lewis Hamilton wrapping up the drivers' crown in Austin already seems a long time ago. And even aside from who tops the championships it is remarkable just how little is it at stake in this final round. You have to go down to fourth place in the drivers' table to find a spot that can mathematically change; down to sixth in the constructors'. But this one does matter, and it matters right at the top. 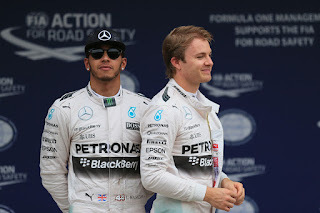 The recent fine form of Lewis's Mercedes stable mate Nico Rosberg has been quite the talk of the steamie lately given he has won the last two and in fine style as well as has taken the last five pole positions - everyone has their theory about it. And as far as the battle between the two Merc pilots is concerned this one is pivotal. A Lewis victory will represent a belated but decisive re-establishment of the usual order as to how the team's match-up sits heading into 2016. A third Nico win on the bounce before everyone goes off on their hols means an off-season with conspicuous doubts on that matter at the back of everyone's minds. Including you suspect Lewis's. But Lewis could hardly have a better place to effect a bounce back. He is quite the specialist at the Yas Marina track, with him tending to be mighty through the snaking, street-circuit like final sector in particular, controlling the sliding rear of the car beautifully though the repeated 90-degree type and often off camber turns on the low grip asphalt. He's won here twice in six visits, as well as has twice more retired with a technical failure having led. Nico may not just have his team mate to think about either as Sebastian Vettel is expected to be a contender at the sharp end too. Ferrari is buoyed by the success of recent updates as well as by how close Seb ran the Mercs in Interlagos. 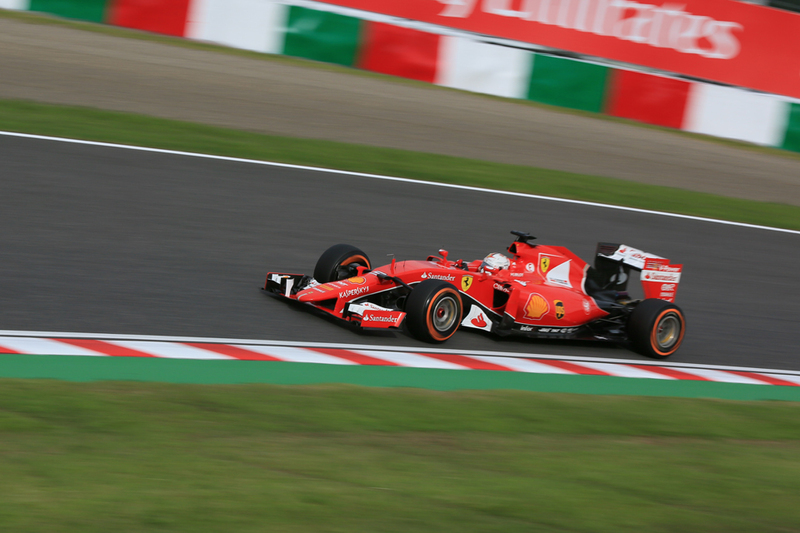 This circuit, without as mentioned a fast turn worthy of the name, should suit the Ferrari much more and Seb is another who thrives in the track's low grip challenges, as evidenced by that he's won here three times. 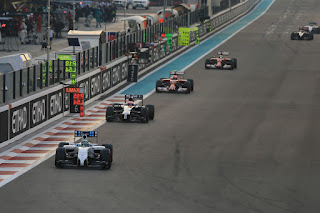 Only once has the Abu Dhabi Grand Prix not been won by either Lewis or Seb. Up until 2013 no one else had taken pole here either. And if as some have theorised Nico really has had a eureka moment with his braking and pivoting of a car on corner entry then it'll serve him about as well here as at any track on the calendar. For more reason than one this new-found Nico will get its toughest test at the Yas Marina track. But Nico has a decent record of his own here even so. He claimed pole a year ago and the year before qualified and finished third, and left Lewis far behind in doing so. In another notorious feature of Brazil unlikely to be changed much here those not in red nor silver will struggle to aspire to more than being things that make noise. But a reasonable bet for a good showing is Felipe Massa who was excellent here last year, finishing a very close second to Lewis and looking for a time in the closing stages indeed that he had the Englishman's victory under genuine threat. 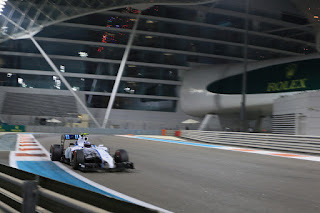 The Williams indeed should fly down the Yas Marina circuit's two lengthy straights which is good news for Valtteri Bottas too as he has just a point over Kimi Raikkonen for fourth place in the table. The Force Indias also have a good record here for similar reasons. While another final table consideration is that Toro Rosso needs ten points over Lotus to claim sixth place in the constructors' standings. Something of a long shot but stranger things have happened. Seventh and eighth, with Lotus no-scoring, would do it. The team really needs to sort Carlos Sainz's wretched reliability though. With overtaking tough as mentioned strategy will be vital here. Presumably Mercedes won't abandon its approach seen in glorious technicolour in Brazil of not allowing much divergence between Lewis and Nico, but Seb being in the mix at least should make things more interesting. Pirelli like last year has brought its two softest compounds, the soft and super-soft. This likely will ensure multi-stop races and indeed last year a two-stopper was the default though a small number went for three - the super-soft while being the tyre to qualify on also was one to ditch as quickly as possible in the race. A few further back had joy after starting on the softs - not least Daniel Ricciardo who came through from a pitlane start to finish fourth - meaning this time all should not be lost even if your qualifying result is poor. One-stoppers aren't unheard of at this race (though with harder compounds than these) as degradation tends to be pretty low due to a lack of fast turns to put high energy through the tyres (though drivers need to be careful not to overheat the rubber on acceleration) and the dropping temperature as the race goes on and night falls can bring things towards those trying to stretch stints out. The general pattern this season has been fewer stops in races than anticipated. And with nothing to lose for most there's little to deter rolling the dice. Despite appearances, there might just be enough reasons coming together this weekend in Abu Dhabi to give this F1 season a diverting send-off. One perhaps that it doesn't really deserve. We have the last race of 2015 Formula 1 season in Abu Dhabi, UAE this weekend starting with the Friday’s precise session. You can watch ABU DHABI GRAND PRIX Online live coverage of races throughout the weekend as we will have live streaming right here on this page all week. On Saturday qualifying rounds will happen while on Sunday race will begin at around 17:00 local / 13 Uk time.